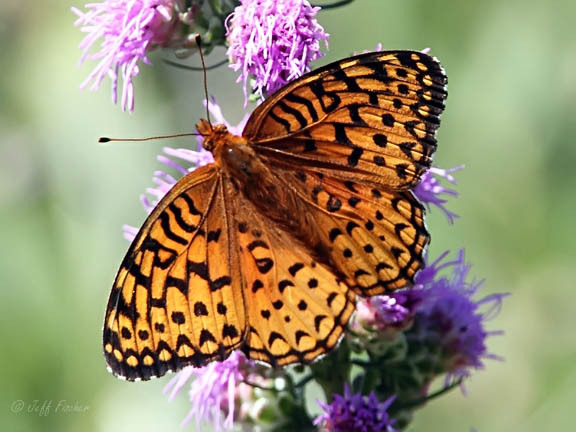 The Atlantis fritillary is a brushfoot butterfly that is found in Southern Canada, and the northern and eastern United States. They usually have one brood per summer and can be identified from other fritiallry butterflies by the black border on the upper side of the wings. Their larval host plants are violets. This year the number of butterflies that I have seen has been way down. It most likely has something to do with the late winter that we had this year. Great picture! Don't think I've ever seen that species. Beautiful composition and colour. And as for those patterns..... lovely.